Comments related settings are at AppearanceTheme SettingsBlog. Comment form allowed tags are displayed below the comment field. They let users know which HTML tags can be used. Disable this setting to remove this section of text. 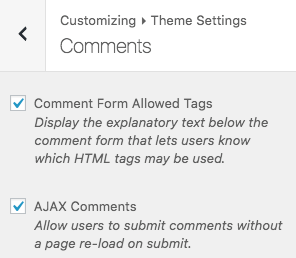 Ajax Comments, a feature of Ultra Premium, ensures that when users leave information out of the comment form or incorrectly fill out a field, they won’t have to leave the page to receive the error message. This feature also ensures the user doesn’t leave the page when submitting a comment. It’s a nice little addition that helps keep comments flowing and your site looking a little more professional.